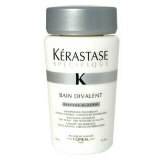 T Product Description Kerastase Specifique Bain Divalent Shampoo is a balancing shampoo for oily roots & sensitized lengths. Helps to refresh and decongest the scalp. Selectively nourishes the dry areas of the hair fiber. Helps purify the scalp, nourishes the lengths without weighing them down for soft, shiny hair.